Active growing of soy beans and use of products of their processing began during the First World War because of deficit of chip oils as for industrial use, so for nutrition. At the present time there are many directions of soy-bean industrial use besides growing interest to its nutrition value. For today soy-bean derivatives are used for production of different products: soap, shampoos, conditioners, inks, cement, cleaning agents, resins, glue, fabrics, etc. Soy is a monocyclic herbaceous plant of pea family. Culture of soy beans has been started in Northern China and inner part of Mongolia for more than 4000 years ago. In eastern Asia soy-bean is a basic food for more than 3000 years. The Chinese call soy-bean “ta-tou”that means “great beans”. Soy-beans were considered so useful for health of humans and animals that Chinese emperor Shen-Hong declared it as one of the five holy cultures. In the course of time importance of soy-bean and its derivatives has significantly increased. On the west soy-beans became available in the beginning of XIX century. However, only after more than 100 years soy-bean was treated as the most important source of protein. Carbonhydrates in soy beans mostly represented by sucrose are almost soluble in water. Soy-bean contains large amount of vitamins А, D, Е, С, and for 6 times bigger amount of vitamin В2 than in wheat corns. Soy beans also contain a lot of non-organic substances (potassium, calcium, phosphorous), as well as phytin. By amino acid composition soy-bean protein is identical to meat protein. Various chemical composition of soy-beans allows to use them for food, fodder, and technical purposes. Soy-beans are used for production of milk, butter, margarine, flour, sausage products, confectionery, and many other products. Soy-bean is widely used for technical purposes – in soap, coating, textile, chemical, and other industries. 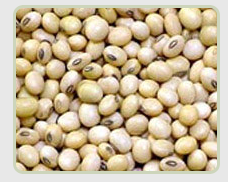 Soy-bean is used for production of plastic, oil cloth, linoleum, lube oils, and many other products. Soy-bean is a valuable fodder crop. The following is used for fodder purposes: press cake, oil cake, soy-bean flour, green mass.